Modern development practices often distinguish between deploying and releasing software. Deployment is the step that involves getting the new code onto the servers. Releasing is the step where the new code begins to receive production traffic. Blue-green deployment is a strategy for deploying and releasing software. It relies on maintaining two separate production-capable environments, nicknamed blue and green for ease of discussion. In this guide, we will discuss how to use blue-green deployments on DigitalOcean to simplify the process of transitioning your users to a new version of your software. In order to complete this guide, you will need two Ubuntu 14.04 servers deployed in an environment that allows you to move IP addresses between hosts easily. 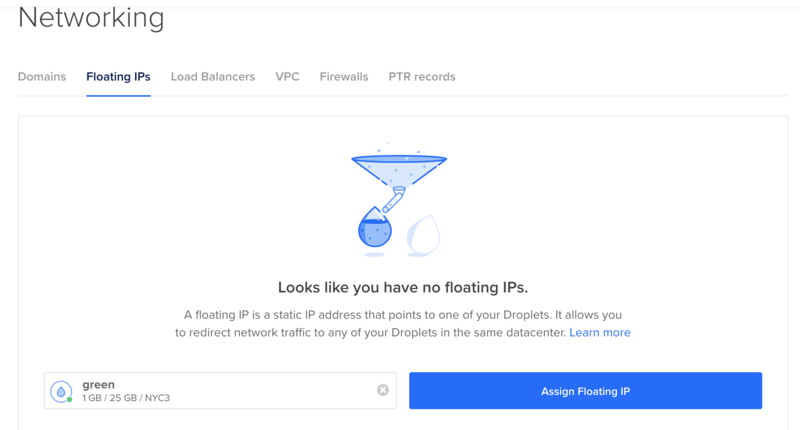 On DigitalOcean, Floating IPs can provide this functionality. These servers will represent two parallel environments that are alternatively used for staging and production. You can call these servers whatever you'd like, but in this guide, we will be referring to them as "blue" and "green". On each of these servers, you should have a non-root user with sudo configured for administrative functions. You can configure these users by following our Ubuntu 14.04 initial server setup guide. The basic concept behind blue-green deployment, a technique made popular by this post from Martin Fowler, is that two sets of environments, each capable of serving your application in production, are maintained. These two environments should be nearly identical. By convention, these are referred to as the blue and the green environments. Only one of these environments is active and receiving production traffic at any one time. In front of the web endpoints for these environments (either web servers or load balancers), a router or other traffic directing mechanism pushes all production traffic to the currently active environment. When a new release is planned, it is deployed to the non-active environment. For blue-green deployments, the non-active environment functions as a final staging environment. It mirrors the production environment very closely and can be used for final testing before deciding to push changes live. Once you have tested your deployment internally and have gained confidence in its robustness, you can release the new version quickly and easily by adjusting the routing mechanism. Basically, you flip the switch at the traffic directing layer so that all production traffic begins to move to your new software version. The previously active environment becomes non-active and your previous staging environment becomes your new production environment. At this point, your previous software version is non-active, but still accessible. If your newly active deployment suffers from any serious issues, reverting to your previous version is as simple as modifying the routing mechanism again. To demonstrate this general concept, we will set up two server environments. Each will have a web server installed. Keep in mind that in this example, the web server represents an entire application stack which could include a load balancer, multiple web servers, and distributed or replicated databases in the backend. We are using a web server in this guide because it represents the smallest environment that can demonstrate this release pattern. We will start to develop an "app" on our local computer. In reality, this will only be an index.html page that we can deploy to our servers. We will configure a git post receive hook on each of our servers so that we can deploy simply by issuing a git push. We will deploy the initial version of our application to both of our servers. In this guide, we will be using a DigitalOcean Floating IP address as our routing mechanism. Floating IPs provide a simple mechanism for moving traffic from one server to another. We will create a Floating IP and point it at our green server to set this as our initial production machine. We will then modify our application and deploy it to our blue server. Production traffic will still be served from the unchanged green server at this point. We can then test the blue server to ensure that our deployment was successful and that there were no bugs. When we are ready, we can move the Floating IP to the new version of the code simply by reassigning the Floating IP address to the blue server. We will start by creating our "application". As stated above, this is actually just an index page that our web servers can display. It allows us to demonstrate different "versions" of the app without the overhead of actual development. git commit -m "initializing repository with version 1"
With our file committed, we will stop our application development on our local machine momentarily and focus on setting up our blue and green web servers. Next, we'll work on setting up our green and blue environments with functional web servers. We will use Apache in this guide. Log into your servers with your sudo user to get started. The steps in this section should be completed on both the blue and green servers. This should install and start Apache on both of your web servers. Next, we will should create and configure a "deploy" user. This user will have access to Apache's web root and will own the bare git repository where we will push our app to. This will create a new user with password authentication disabled. This is all we need for our simple deployment which only relies on moving files into the web root. If you are deviating from this guide and your deployment steps would require root privileges, you'll want to configure passwordless sudo privileges for needed commands for use with the deploy account. Save and close the file when you are finished. This should allow the deploy user to correctly execute the required commands without a password. Now that we have Apache installed and a user configured to execute the deployment, we can configure a bare git repository to push our application to. We can then set up a post-receive hook that will automatically deploy the newest version of our master branch when we push it to our servers. echo "Master ref received. Deploying master branch to $HOSTNAME..."
echo "Git hooks deploy complete." echo "Ref $ref successfully received. Doing nothing: only the master branch may be deployed on this server." If you are deviating from this guide and need more complex deployment steps, add them to the then clause in the script above. Make sure that any steps that require elevated privileges in this section use the sudo command. Also, make sure that all commands that use sudo here are added to the sudoers file as specified at the bottom of the last section. Next, we will configure SSH keys so that git can push changes to our web servers without prompting for a password. If the command executes correctly, copy the text that is displayed in its entirety. We will use this in the next section. You can safely skip there now. This should execute correctly this time. Copy the displayed lines to use in the next section. Back on your green and blue servers, we will authorize our account on our local or development machine to connect to our deploy users. Now that we have SSH key access configured to our web servers and our application directory set up on each server, we can add our blue and green servers as remotes in our local git app repository. We should now be able to push our app to both of our servers. Let's test it out by pushing version 1 of our application to both servers. ECDSA key fingerprint is 30:a1:2c:8b:ec:98:a3:3c:7f:4a:db:46:2b:96:b5:06. Warning: Permanently added '111.111.111.111' (ECDSA) to the list of known hosts. Writing objects: 100% (3/3), 246 bytes | 0 bytes/s, done. remote: Git hooks deploy complete. As you can see, the lines that begin with "remote:" contain the echo statements from the post-receive hook on our server. Remember to push your app to both of your servers. This indicates that our deployment script works correctly. Now that we have the initial version of our application deployed, we can create a Floating IP address and point it to our "green" server initially. You can now use this IP address as the primary entry point into your production application deployment. If you wanted to set up a domain name for your web app, you would point the domain to this Floating IP address. The green server is currently supplying this response. Now that our configuration is complete, we can demonstrate how blue-green deployment works in practice. Currently, our Floating IP address is pointing to our green server. As stated previously, the Floating IP address represents production traffic and would be the location where we would attach our application's domain name. git commit -m "Application version 2"
Next, we can push our new changes to our non-active environment. This will give us the opportunity to test our deployment without impacting our production server. This is what we expect and what we want. We can now run our blue server environment through whatever internal testing that we need. All the while, the green server will continue to serve our production traffic. Once you have tested the newest version of your application and are confident that it is performing as expected, we can switch the production traffic over to the blue server. Stop the while loop by pressing "CTRL-C". Your production traffic is now being routed to the new version of your application. Your previous production server, the green server, is now set up as both your rollback machine and your next staging area. If, after moving traffic over to the new version of application, you discover a problem, this release strategy allows you to roll back to your previous version quickly and painlessly. To do so, just reverse the process and point your Floating IP address back to the green server. The scenario outlined above was simplified in order to focus on the deployment and release strategy itself. However, we didn't touch on more complex, but common setups, like those involving databases. There are a few different strategies that you can use to handle the persistent data between your two environments. It is possible to maintain a separate database for each of your environments. However, this strategy would require that you replicate the data in the production database to the non-active database and stop transactions during the moments when you are initiating a switch. Basically, it would require a live database migration as well as a few moments of down time on each deployment. This could quickly become very time consuming and error prone. A better alternative is usually to share a single database system between the green and blue environments. The application code will be switchable using the blue-green release strategy, while the database itself will used by both environments. The main concern with this approach is how to deploy and release updates that include non-backwards compatible database migrations. If we deploy a new release to staging that adds to or alters the database in a way that doesn't work with the current production deployment, we will break our application. To prevent this from happening, it is often best to deploy your migrations separate from your code base deployments and in stages where necessary. This modified process is sometimes called blue-turquoise-green deployment. Basically, it hinges on deploying an intermediate version of your application code that can handle both the old and new versions of your database. The intermediate application code is almost completely the same as the older version, but with some additional logic that prepares it for the new data structures that will exist after the migration takes place. Often, this is accomplished by constructing the migrations so that they create completely new data structures instead of modifying existing ones. This way, you can keep the old data structure, let's say a table, and create a new one that includes the breaking changes. The intermediate turquoise deployment is deployed as the first step in the migration process. This deployment will at first read from and write to the old table, but it will check for the existence of the new structure. Next, the migration itself is run, creating the new version of the data structure alongside the old version. The turquoise deployment's logic should be configured to recognize that the new structure is in place and it should start writing changes to both the old structure and the new structure. It will continue to read from the old structure for the time being. At this point, all new activity will be recorded in both data structures. You can backfill the new structure with the data from the old structure, transforming it along the way to satisfy the conditions of the new structure. When this is complete, all of your records should exist in both locations. To continue the transition, the next application deployment might continue to write to both structures, but may read from the new structure. After everything is confirmed to be running smoothly, another deployment might cut off writes from the old structure and the old structure may be deleted. This process can seem fairly involved at first, but it is usually not too much additional work in practice. The main work involves building a safety net that will use both the legacy and new structures temporarily. This gives you time to test your migrations in depth before committing to them, and allows you to roll back at any point to the previous working version of your data structure. For an example of how this data migration could take place, take a look at some of these slides from Mike Brittain at Etsy. While there are many other strategies that can be employed to separate deployment from the actual release of your new code, blue-green deployment is a rather simple mechanism that is quick to implement. It provides a good staging environment that completely mirrors the production environment, while offering immediate rollback opportunities following a release if things did not go as expected.